Just after 3.00pm on Saturday 7th February, when AP McCoy announced his intention to retire, the complexion of the remainder of the season completely changed. Cheltenham Festival 2015 inclusive took on that little bit extra significance. I still find it hard to come to terms with the fact this will be the last time we'll see him ride at the four day extravaganza. For the majority of my life I've grown up with the presence of AP, either when standing as a bookmaker, sending the prices to the betting shops for SIS or working for Channel 4 Racing. AP has been responsible for many chapters of National Hunt history yet his relationship with the Festival has never been the smoothest. Despite 30 winners at the meeting to date, he has only been leading jockey twice, plus victory in the World Hurdle has evaded him. The increasingly positive bulletins regarding More Of That may give hope the small matter can be rectified. Such is AP's influence that all his mounts over the four days will come under the closest of betting scrutiny and thus their odds may be distorted, too short for their ability. Fate can cause coincidental results and this time round may choose to be kind to the champ. When the betting came out for top jockey I was anchoring to get on Bryan Cooper, as numerically he'll have a fleet of good mounts for his retainer Gigginstown Stud. Now though I also sense backing AP McCoy would be no bad thing. There are sure to be specific markets for the champ which I'll form an opinion on nearer the time. Surprisingly though there has been very little mention of AP McCoy, instead most of the intense focus has been on trainer Willie Mullins and the 50 or so horses he'll be sending to Gloucestershire. A team even to the trainer's own admittance is the strongest ever. Wind back the clock to late February 2014 and Willie Mullins had six of the 27 favourites, such is the growing power this time around the number of favourites he can lay claim to is ten! How many winners will he have? The current number floating around is a phenomenal six, and he has had 33 in total, with four successes last year and five in 2013. It's worth considering that in some races he has got more than one runner and both are high up in the betting. For bookmakers the first day is key, as Willie Mullins could dominate and have layers reaching for their supposed impenetrable vaults, and in worse case scenarios taking an early bath. I'm tempted to be at the ready to stand up on any of the empty pitches, what a buzz that would be - if only. I digress. The one concern I have over the Mullins contingent, with such concentration in one stable where is the barometer to their overall ability? Where is the challenge or the test? So often his runners are in races which are invariably a stroll in the park, the odds don't lie. Their prices are prohibitive. It's difficult for us watching to gauge just how good they are. It's only when Faugheen turns the Christmas Hurdle into a procession that we can attempt to assess the Champion Hurdle form. There is an element of respect when absorbing stats such as his four Supreme wins, including the last two: Champagne Fever and Vautour. Many won't accept defeat for Douvan; sometimes it's good to psyche out the opposition, sometimes it bursts the confidence bubble to ultimate deflation and indeed our bank. There's a fleet of horses I fancy in the Supreme and Douvan isn't one of them. I'll hold that thought and my intentions until nearer the time. As for the Arkle and Un De Sceaux, all that is to be said for now is that of the last seven odds-on favourites to have run, six have won. I note and have been attracted to a couple of match bets on the site already. Tuesday's Champion Hurdle could contract into a small but select field and I'm willing to oppose last year's victor Jezki and The New One is an ideal horse to match him with. He was crabbed for his run at Haydock recently, yet he was the only horse to quicken on the ground and in the end won a tad easily. In the end the result was very deceptive. Whereas I grant you only one race matters for Jezki, and he has been performing well against his old adversary Hurricane Fly, but he makes the odd unforced error, a major negative in my book. The other being Silviniaco Conti versus Road To Riches, although neither are on any ante-post slips of mine. My Gold Cup allegiance lies elsewhere, but I think Silviniaco Conti holds the advantage in this little match. This season he has appeared better and stronger, while connections have shown more conviction and to some extent he has intimidated his rivals. Add to that the floater that is Coneygree, if he runs then Road To Riches will be put under pressure from the off. With each year that passes the road to Cheltenham starts sooner, the intensity is stronger, the mentions relentless. It's a shame as there are plenty of quality races along the way which deserve their own limelight rather than be acknowledged as just a stepping stone to March. The Festival frenzy gathers momentum in extremes as soon as the previous year has been completed, and then it reboots as soon as Cheltenham's doors ease open in October for the new season. Though these days the big names tend to avoid each other, intent on taking the easy option, biding their time and waiting until March. This is incredibly disappointing, leaving us to speculate and making it increasingly difficult to collating the parallel form. Thankfully, though, we are now at the start of Festival Preview season where quite often nuggets can be gleaned. Channel 4 Racing has asked all the team to rustle up their Festival Fancies. Nick Luck flagged up Johns Spirit in the Ryanair Chase and Graham Cunningham Value At Risk for one of his three novice hurdle entries. I sent in a list of eight, yes eight, headed up by Thomas Brown, the filming of which should be aired this Saturday (28th February) on the Morning Line. It's not always the best horses that win, but those best equipped to the conditions. Thomas Brown is a terrier, full of grit, determination, tenacity and his constitution, style of running and character are ideal for the Albert Bartlett. My fingers are tightly crossed. Other names to throw out there are Eduard in the Ryanair Chase and Seedling in the Supreme, but it is still early days. Preference in this quarter is to wait for the day of the race. How has the punting been for me of late? Well, the Couch will sympathise, even feel my pain. The NFL was wounding, I'd backed Green Bay Packers for the Superbowl and New England to save the stake. Yet recovery from what ensued, nigh on impossible. The Packers snatched defeat from the jaws of victory in emphatic fashion, leaving me mentally scarred. The Kiwi cricket team and the PGA Tour have since repaired the financial damage but come September there'll be mixed feelings and a hesitancy before ploughing into Green Bay again. Both the golf and the cricket play in the background while I scour through race replays on the laptop, paperwork, facts and stats. Calculating and assimilating your own research helps the memory and in turn the punting. Also being privileged enough to be in the thick of the action is invaluable. The immediate reaction to Beltor winning the Adonis was met with disbelief as the initial quotes of 16 for the Triumph were believed to be too big. His domineering and hard pulling success was awesome, but it concerns me it was achieved on very soft ground. In any case, it was no different to Devilment's similarly facile win at Doncaster on the Wednesday. Sire De Grugy showed he is back in no uncertain terms. The bravery of allowing him to run in extreme conditions, giving lumps of weight away, was a joyous return to the old days when top class horses showed their worth by running regularly, and in handicaps. Hallelujah! No surprise, the 7-1, disappeared, as did the 9-2, then the 4-1, and quite rightly he is challenging for favouritism just a shade behind Sprinter Sacre's 3-1 at 7-2. Now there is some fun to be had in match betting on this race on the Wednesday, I can't wait for Sporting Index to set those up. There is a tingling in my bones to expect the unexpected this year. That said, pitching the biggest winning SP at 48 seems rather high so selling at 46.5 may be an option, although I do like some horses currently priced at 25-1. For now a big thank you to Sporting Index for having me and you for being part of my Cheltenham journey. I'm off now to absorb as much information and data I can, I'll be back soon with my analysis of a few key races before posting my thoughts ahead of the action on each day of the Festival. Here's to a good one. Sporting Index traders have been busy studying the form and crunching the numbers ahead of the Cheltenham Festival which starts on Tuesday 10th March. The annual National Hunt extravaganza is one of the biggest events of the whole year with hundreds of millions of pounds gambled in the UK alone. Although final declarations for the races aren't made until far closer to the time, we have a good idea of who will be running in the four Championship races - the Champion Hurdle for two milers (Tuesday); the Champion Chase for two milers (Wednesday); the World Hurdle for staying hurdlers over three miles (Thursday); and the Cheltenham Gold Cup, the blue riband event for the best chasers around over 3m 2 ½ f on Friday. Last year's Champion Hurdle was an eventful contest, sadly marred by the early fall and subsequent death of 2013 Triumph Hurdle winner Our Conor. His tumble badly hampered The New One and many observers, noting his flying finish for third, believe it cost Nigel Twiston-Davies' star the race. Jezki, the second string of the JP McManus runners that day, held off AP McCoy on My Tent Or Yours in a thrilling finish and is back to defend his crown. The Jessica Harrington-trained horse has only ever finished out of the top three once over hurdles, and is a six-time Grade 1 winner. Having been beaten three times this season, though, behind the great Hurricane Fly every time, many think the seven-year-old has much to prove. Not as much as The New One surely, however. That one has won 11 of his 15 hurdle starts, but only two have been at the top-level and both of those victories were over further than this two mile trip. Once you factor in that 10 of those wins have been at odds of evens or less, including 1/6, 2/11, 1/3, 2/7 and 4/9, it's not difficult to come to the conclusion he runs in mainly poor quality, uncompetitive contests. The son of King's Theatre has won all four starts this term but hasn't been impressive and it's surprising to see The New One/Jezki trading at 0.5-2 for the Champion Hurdle (prediction of the distance between the two horses when they cross the line in lengths). Backing a horse in a race because you feel they were unlucky last time is a poor betting strategy that doesn't take into account the fact the conditions of the race are different - a different field, different pace angle, different ground, etc. While ante-post Faugheen looks the real deal and could easily beat both these two horses, Jezki deserves more respect as the defending champion and, noting how he seems to come alive in the spring, is a solid wager to put a good fight defending his crown. Therefore, a sell of The New One at 0.5 is the early advice for Tuesday's showpiece. Sporting Index have already released a number of Cheltenham Festival markets and will be pricing up many more in the lead-up to the event, not to mention comprehensive daily markets during the week. With more bets on horse racing than anyone else, Sporting Index is the leader in sports spread betting and has the sport of kings well and truly covered. 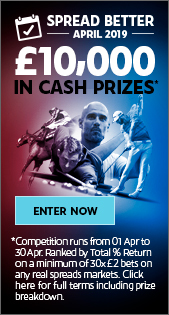 Whether it is betting on one horse's supremacy in lengths over another or buying the performance of a jockey over the course of a meeting, bettors have never had such a wide and immersive betting experience. 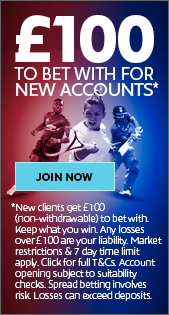 For a superior horse racing betting experience, sign up for a Sporting Index account here.